Christmas – The Baking Beauty Blog. 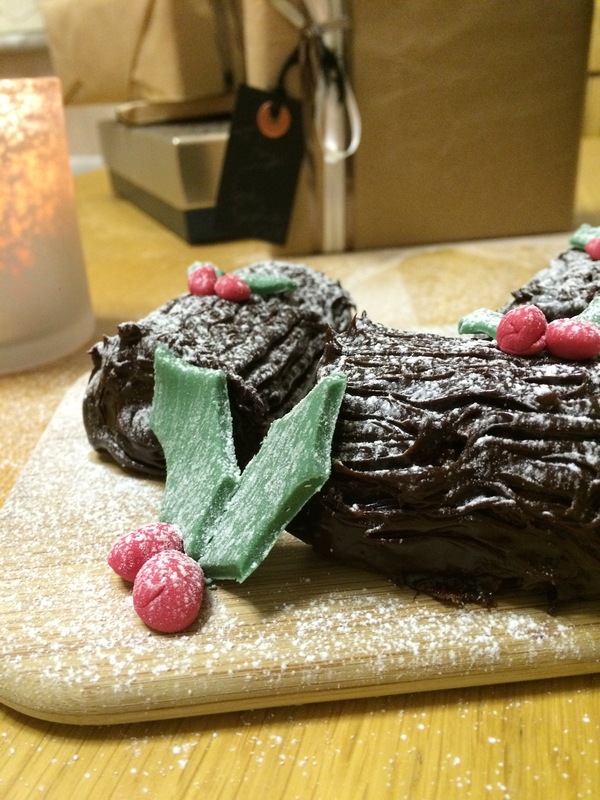 This Yule log is inspired by a recipe I’ve seen on Cupcake Jemma’s YouTube channel, which I’ve tweaked and pimped up to make it even more epic. Which should give all you lovely people a bit of luxury and decadence amongst all the increasing stress of Christmas. 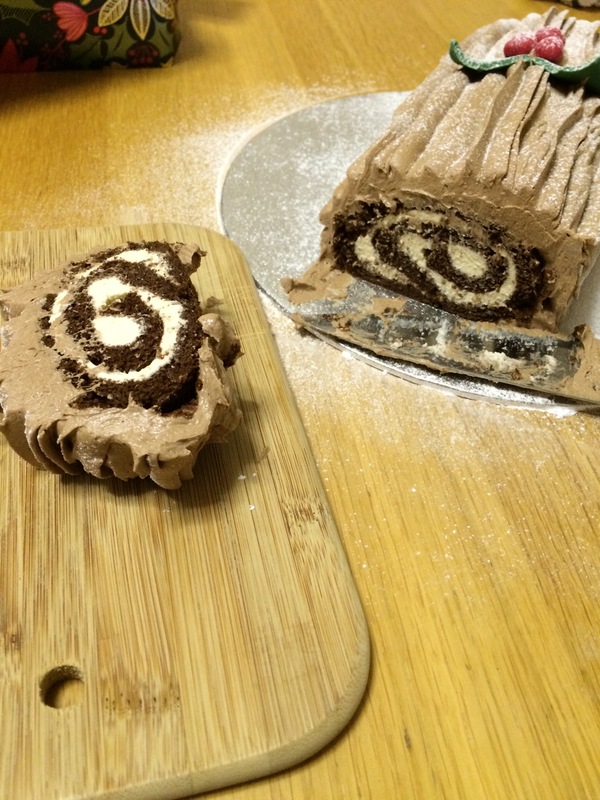 This fantastic Swiss roll sponge recipe will be great for your big Yule log, or alternatively you can follow my steps up to spreading the cream, then cut the sponge into equal oblong shapes and roll them into minis. The yield of this recipe makes one centrepiece Yule log or 8 minis. Start by separating your eggs into whites in one bowl, yolks in another. Whip up the egg whites using a hand whisk until they have soft peaks. Then add 25g of the sugar and whip up again until they have stiff peaks. Now set this bowl aside. Now using your hand whisk again whip up your egg yolks and the remaining 50g of sugar for a few minutes until it’s doubled in volume and turned a buttery light yellow colour. Then sift in the cocoa and spices and fold them in gently until combined. This mixture will be very thick and sticky so bare with it, it will look more like a sponge mixture in a minute. Now in four stages fold in the egg whites to the yolk and cocoa mixture. The first spoonful can be folded a bit more vigorously just to loosen it up a bit. Then gently with the other additions to keep as much of that precious air in the mixture as possible. Prepare a Swiss roll tin or a shallow baking tin by greasing and lining with baking parchment and pour your mixture in. Use a cranked palette knife to guide it to the edges and level it out gently. Now bake it in the centre of your oven for 10-12 minutes, or when it’s just springy to the touch at 180c or gas mark 4. Once it’s baked turn it out onto a clean chopping board and cover it with a clean tea towel as it cools. After about 10 minutes of cooling you’ll need to roll the sponge up with the to make sure it won’t crack, but in the meantime you can whip up your cream. Whip the cream until it’s at soft peaks, go too far and you’ll have made your own butter. Then whisk in the baileys. Now unroll the sponge and spread the cream on gently, but not too thickly otherwise it won’t roll up tightly. Be careful with this bit and roll it up again, but obviously without the paper inside. Now if you’re making the buttercream whip up the butter until it’s paler in colour, then whisk in the sugar, melt the chocolate in the microwave or over a Bain Marie then mix that in with the cocoa powder, baileys and Christmas cake curd until it’s all smooth. Fill up a piping bag with a star nozzle in it with your buttercream and pipe onto your log until it looks sufficiently loggy. Don’t forget to pipe the spiral on both ends. Alternatively if you’re opting for ganache, heat the cream over a low heat until it’s nearly at a boil but don’t actually let it boil, then pour it over the chopped chocolate. Leave it to stand for about a minute or two then stir it until it’s a glossy, smooth mixture. Give it 5 minutes to thicken then spoon onto your log and with a palette knife, spread it all out evenly, again not neglecting the ends. After about 5-10 minutes to let them set slightly, use a cocktail stick or a fork to make log effect wiggly lines down each log, and use a single cocktail stick to create a spiral on either end. Now make it snow on top with icing sugar in a sieve, and top each one with little fondant holly decs you can easily buy from most supermarkets, but I made mine with fondant I dyed green and red. Don’t give it to your guests, just eat it all yourself. I did.